Being Retro: Who's a Bad Robot? 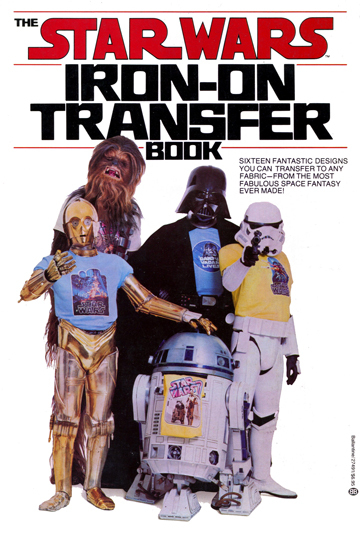 Iron on Star Wars transfers? I want! I'm not saying that the original trilogy was perfect but the story was better and honestly more believable. I am looking forward to the reboot simply because I think Abrams can do it justice - he's a fanboy and did well with Star Trek. 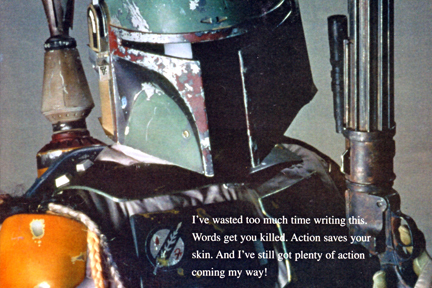 My one hope is that he doesn't try to cram old characters into like the prequels. I wouldn't mind, even, not seeing an old Luke, Han or Leia - give us the kids and move on. The first animation is funny. That said - I have ALWAYS been a Star Trek fan, from original series through the new movies. Trek will always win over Wars for me, and I'd much rather see a new Star Trek film than a new Star Wars any day. It's funny. Trek has gone through so many incarnations, so many casts, so many formats, that another reboot should have been easy to swallow. I loved TOS, TNG, and DS9 . . . and liked parts of Voyager and Enterprise. I saw the movies, I read the novels, and there was even a period where I devoured the comics. Despite all that, Abrams vision just fell flat for me when I saw it on the big screen once. I didn't hate it, I just have no desire to ever watch it again. As for him getting his hands on Star Wars, I honestly don't know what to think. It's Star Wars, so I'll give it a chance, but I really have no expectations at this point, good or bad. Not a fan of Abrams whatsoever, so I'll be seeing this movie never. Too bad, someone badass could have done it! Not a fan of the prequels though, die-hard fan of the originals though! to me this all depends on the casting. STAR TREK have had the most amazing one, with utterly brilliant Urban, Quinto, Cho, even Pine and Saldana and Yelcin. If they cast STAR WARS wrongly, the film will fail for me. I enjoyed the Star Wars Prequels but, to be honest, I haven't bought them or watched them more than once. That Bad RObot image is great, and I think I actually had some of those Iron-ons. Those were the days Jeremy. I'm a die-hard fan of both franchises!